These 5 books may not all be literary classics and some may not even be known to you at all, but they are ones that I come back to over and over again. We all have books like these…the ones with stains and finger smudges on the cover, tears on every other page and binding that, well, no longer even looks like binding. Or books that we have so engrained in our memories that we have no need to open the pages ever again. Below are the five books that have stayed with me over years. These titles are in no particular order. When I was a little girl, my grandfather would read these books to me every night. I remember him lying on the floor next to my bed, holding my hand, reciting the books from memory. He would exaggerate the “toooooo bigs”, “toooooo smalls”, and “juuuust rights”. The “huffs”, “puffs”, and “blow the house downs”. Now I read these books to my almost-1-year-old son every single night. He snuggles up on my lap and we read together. His little fingers tap on the pages as I read the words, and he ooohhhs and aaahhhhs along with the extended vowel sounds. I have no doubt he will remember both of these classics for a very long time. When my husband, son and I moved in February, I used the move as an opportunity to purge and sort through old bins, drawers and files. While sorting through a box that had made a home in a basement for the past 15 years, I ran across a sequel of Rebecca that I wrote for a 10th grade school project. This jogged another memory of creating a movie at my Aunt Madeline’s house on a lake in the Scranton area depicting the most important plot points in Rebecca. Obviously, I loved the book then, and I still love it now. The cover is missing and the pagers are yellowed – I must have read the book a dozen times. Love. Love. Love. The first time I read Jane Eyre was in 7th grade. At that time I am pretty sure I didn’t understand much of what was occurring, but then my mother urged me to read it again in 10th grade – after my first reading of Rebecca. Like Rebecca, the book was dark, mysterious, and gothic – all characteristics I looked for. I’ve read the book over and over again, and I’ve seen every movie adaptation released (multiple times). If you are a middle/high school teacher, or a parent of a teenager, I recommend reading this book. I did a short-review of this a few weeks ago on the blog, so if you want to read more you can check it out. Although I have only read this book two times, it is one that has most definitely stayed with me. Also – I can’t wait to hear Jay Asher speak at this year’s PCTELA conference! What are some books that have stayed with you? If you’ve been following my reviews, or you know me, you know I’m teaching American Lit this year to juniors, and I’m starting with Into the Wild. This means I’ve been reading all kinds of relevant materials. A co-worker brought me her copy of Wild, thinking I might find something to use in class. I read it within a few days, as I found it really resonated with me. I’m not sure how many people know this about me, but when I was 17, I decided I would thru-hike the Appalachian Trail by myself after graduation. I have no idea what put the idea in my head or why I thought it was a good idea (maybe it was reading too many Emerson essays), but I knew I didn’t want to go to college right away, and I felt like I needed to say something to people who asked what I was doing after high school. Needless to say, I lasted barely 3 weeks on the trail before I came home, dejected and feeling like a failure. I did hike most of the Maine portion, though, and I did learn a little bit about myself in those days on the trail. 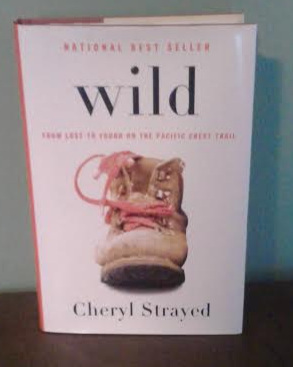 Strayed’s book delves into the why of her going on her journey on the Pacific Crest Trail (the western version of the AT, but, much more treacherous), but also the how of it. Her trip was only two years after my own failed attempt, so I felt a certain kinship for this time period–no cell phones, no email, and a moment when she finds out Jerry Garcia had died (I recall where I was when this happened…sometimes I wonder if for my generation this is like hearing about John Lennon’s death?). What I really enjoyed about this book was Strayed’s honestly about what a hot mess she was after her mother died and she divorced her husband. I liked that she was willing to be brutally self-reflective and consider all the choices she made. I also liked that she was strong and brave and fearless, even when she was not feeling strong or brave or fearless. Her descriptions of the trail, and some of the history of the trail were spot-on, but for me, it was her description of the excruciating pain of her feet when she was hiking. I owned a similar pair of boots to the ones she had (only mine had green laces, not red) and they ripped my feet up similarly to the ways hers were trashed. Her writing recalled that painful hobble of hiking in them in a really visceral way. I also found a great passage to use as an excerpt–from the prologue, where one of her boots has gone over the side, and from the middle of the book, when we catch up to that exact time in her story. It is a chapter that begins by telling us “It was a woman who first thought of the PCT. She was a retired teacher from Bellingham, Washington, named Catherine Montgomery.” It was 1926. Strayed thinks about Montgomery and being in the wild right before she loses her boot. And then tosses the other one and just keeps on going. I believe the movie adaptation of this book will come out in early December. The trailer seems like it will stay true to the book, and it has some of my favorite quotes/scenes portrayed fairly accurately. I will definitely go see it, since I like Reese Witherspoon, and I enjoyed the book. Happy trails to you all as you start you school years, and happy reading! I am not the greatest English teacher ever. I take forever and a day to grade and return student writing assignments. I’m too sensitive, and I take it personally when students aren’t interested in a lesson. I spread myself thin between teaching, coaching the swim team, and trying to keep up with my own reading and writing, not to mention finding time to spend with my wife or to clean the house. When I don’t get enough sleep, it’s easy for me to growl at students for minor infractions. My mind never fails to spin with innovative and engaging ideas, but the time to implement them seems to shrink more and more each year. It was long past dark when I got home from practice one night this past January. A variety of events had teamed up to earn a “one of those days” label: a lackluster discussion in Period 3 (that had gone well during Period 2), an argument with a student in Period 5, and a long afternoon preparing results for a team meeting. It was only Monday. Four teaching days and three swim meets still loomed ahead of the weekend. I should have spent an hour whittling down the stack of student papers (which had grown tall enough to peek over the armrest of my recliner) and then gone to bed. Instead, I opened Facebook. After a few minutes of mindless scrolling, a message popped up. Next to the bubbly text was the smiling photo of a former student who had relocated to the west coast a few years after she was in my eighth-grade English class. Does she know what time it is? I thought, but to be fair to the student, it was three hours earlier in California. I suppressed a sigh and asked a few questions to investigate. She had read Jonathan Swift’s “A Modest Proposal,” and her assignment was to write a satirical proposal of her own. I started with a quick account of the brilliance of the essay, which is that Swift combines social criticism with satire by taking an issue from his place and time (the societal burden of the children of underprivileged families) and maintains a straight face as he offers an implausible solution (selling the children to the rich for food), even going so far as to offer methods of preparation. “Sending every kid in the world to another planet?” she answered. Her suggestion sparked the memory of a recent article about successful tests on the Virgin Galactic Space Plane. I sent her the link, and she had the guts of her proposal (Richard Branson would fly all the children in the world to another planet to save them from abuse). After a quick conversation about how she’d flesh out her essay so that her ridiculous proposal was totally possible and logical, thereby encouraging the reader to consider actual solutions, she was set. I was appreciative of her gratitude and flattered by her compliment, but what I doubt she realizes is how much our informal tutoring session helped me. Having the chance to help her saved me from a foundering sense of self-worth after a tough teaching day. At the heart of the complex job of teaching is personal connection with students. Amid a hundred frustrations and a dozen failures, there is still room for one success, and that can make all the difference. I am not the greatest English teacher ever, but in that one moment, for that one student, I was. This year (and last year) our principal asked us to take risks, try new things, and have fun. I’m formalizing the risks I’m taking this year by writing about them and posting them here. Feel free to share the risks you’ll take in your classroom this year. No desk. I moved classrooms again this year (I often do, and I’m usually teaching in two classrooms). 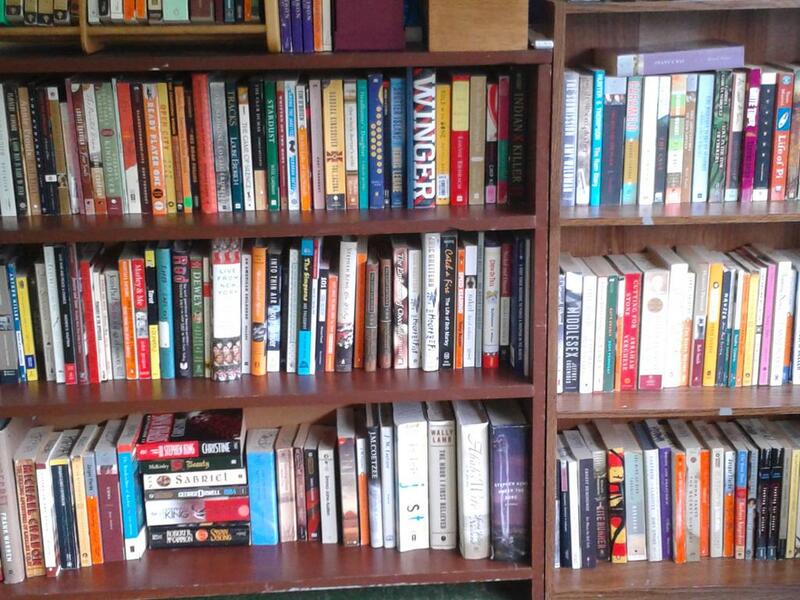 This year, when I moved into the room I will teach 4 of my 5 classes with, I wondered where I’d be putting my choice reading bookshelves. The back corner was the perfect spot, but the previous teacher had a fortress of a desk. I had nowhere to put the desk if I wanted to have my books (especially since I had to be able to fit 28 student desks in the room). The simplest solution: dump the desk. Instead, I have a bookcase with all the materials that used to be on/in my desk. We’ll see how I feel after a few months of this, but I feel freed, in a way. It means I will always be among my students and there is a more democratic feel to the classroom. Lots of elementary teachers have done this and written about it, but I’m not sure how many secondary teachers do this. Let me know if you’ve gotten rid of your desk and have any thoughts. Infographics. Last year, I learned about memes and how to integrate them into the English classroom. This year, I want to figure out infographics. (Here’s a cool one about how teens use social media.) I’m the kind of person who has a hard time reading bar/pie charts, so this is a real challenge for me. But with the increase of visual media to share information, and the amazing images out there that convey information in an engaging way, I feel like I’m doing my students a dis-service if I don’t at least try to tackle my weakness. I’ll start by introducing them, having students interpret them, and then, hopefully, my students will create their own (in partners first, then on their own). One class without a seating chart. I mentioned I teach in two classrooms. For the one class I have in another room, I want to try not having a seating chart. They’re juniors, so this isn’t a crazy idea, and it is a class of 22, so it isn’t a huge number of students, but I want to give them the opportunity to make their own decisions about where they sit. It will be interesting to see if this class has issues with seating in comparison to my other classes. New way to do vocabulary. Aside from charts and graphs, my other Achilles heel of teaching is vocabulary. I struggle with giving standard quizzes, since students have often shared that they cram the words in for the quiz and then immediately forget them. I’ve been thinking all summer of ways to have meaningful vocabulary study. Since I’m starting my juniors with Into the Wild, there are many words I’m fairly sure they won’t know. So here’s my solution: a pretest on words. If students earn an 85% or above, they’re done. If they don’t, they take the quiz until they *do* achieve 85% or higher. I’ll do this three times (split the book into 3 parts). My plan is that they will have to learn to words, or at least look them up to do well. The bonus is that we have an online course system, so once I set the quiz up, they can just keep taking it over and over (and see the words over and over!). Again, it will be interesting to see how this works in practice. Taking a full-year intern. This isn’t a new risk, it is one I take on every year. Working with the Penn State Professional Development School is exciting and invigorating, but it is always a risk. I open my classroom to a stranger every year and work with them every day for the entire school year. I’ve done this enough times to know that this is a risk that is totally worth it–but there is always an element of trepidation in sharing your teaching space with another person. But like most risks, in the end, it is worth it. Over the years I have formed strong friendships with interns, and many have become close friends and colleagues. I feel lucky to work in a school that has access to an amazing bunch of student teachers committed to working in our district for an entire year. So happy new year to all of you out there. And take some risks this year! Share them with us, or write about them and we’ll post your reflections here. Posted by Kate, VP Secondary PCTELA. My father died today. After a relatively short 2 year battle with ALS, he is finally at peace. I slept in the hospital last night with him. Reflecting, processing, preparing for the inevitable. I reread Tuesdays with Morrie. The first time I read this book, years ago, it did not leave a lasting impression. It was touching of course, and an emotional read, but not personally relevant since I had never lost anyone close to me before. I realized a few weeks ago that the man Mitch Albom was visiting in this book had ALS. In addition to this horrible disease, Morrie and my father had a few other things in common. Morrie loved his family. He was selfless. He positively influenced every life he touched – and people loved him desperately. Both Morrie and my father chose upon the day of their diagnosis to live and love and experience life to its fullest until their last breath. They chose to fight. They never hid from life – good, bad, or ugly. Tuesdays with Morrie chronicles the weekly visits Mitch Albom had with Morrie during the last few months of his life. They discuss death in a way that makes the reader want to live and cherish life without fearing the end when it comes. Morrie’s attitude inspires the reader to embrace life. With the Ice Bucket Challenge sweeping the nation (#IceBucketChallenge), the ALS Association has raised well over 30 million dollars in just one brief month. They use this money for ALS research and to provide support for people diagnosed with ALS. My father lived to see the comraderie of his family and friends joining in the Ice Bucket Challenge and posting their videos on Facebook. He lived to see the boom in funding that the challenge brought to ALS research looking for a cure. Currently there is over 30 million dollars in donations where less than 2 million dollars stood last year in the same amount of time. Reading Tuesdays with Morrie last night was personally cathartic; however, I urge you all to read it before the end of the month. It only takes a few brief hours to read. Each chapter is short but well placed and poignant. Mitch Albom intersperses memories of college (when Morrie was his professor) and memories of his weekly visits – what they called Morrie’s last class. ALS was hardly known at all to most people last month, but with the Ice Bucket Challenge going viral, it makes sense to read this heartbreaking and inspiring book so that you can get a feel for what ALS is and how it works. Gaining insight into Morrie’s unique mind and his zest for life is something that will hopefully stick with you even if you’re only reading it for the first time like I did a number of years ago. Morrie did three interviews with Ted Koppel after his diagnosis in the early 1990s. See his first interview here. 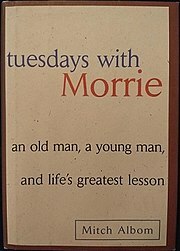 Mitch Albom taped his meetings with Morrie. He provides some of those audiotaped interviews on his website here. As the summer draws to a close, I’ve been trying to read more books I would consider beach reads rather than books that might enrich my teaching. I’m busy trying to cram as much pleasure reading in to these last few days. I think the universe is looking out for me, too. I don’t know about all of you, but I have a hard time buying a new hardcover book, especially when I could get 2 or 3 for that price! But when a new book by a favorite author comes out, I’m torn. Just my luck, though, I was at my local independent bookstore, and I saw Stephen King’s Mr. Mercedes there for almost half it would have cost at Barnes & Noble. Kismet, I thought. I’ve been a fan of Stephen King since I was borrowing my brother’s books in seventh grade. There’s a reason I’m afraid of clowns, St. Bernards, and automated cars and I blame Mr. King (and sometimes my brother). 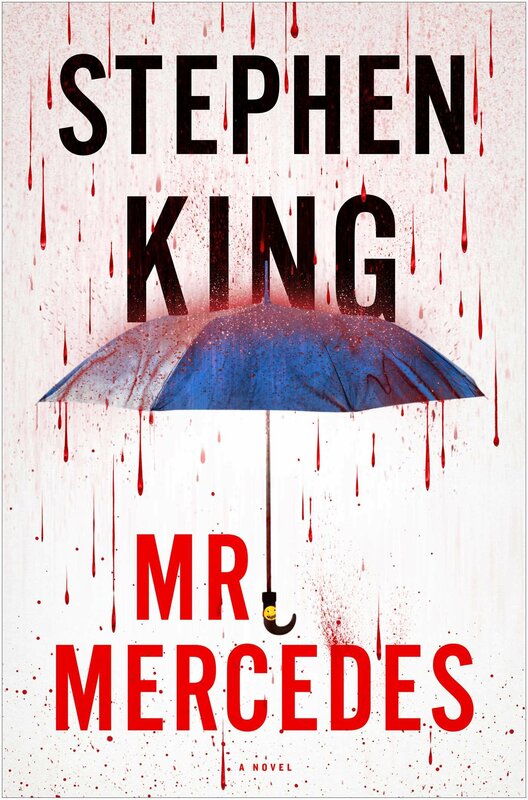 Mr. Mercedes, a classic King novel, is a quick read, and more of a psychological thriller than horror. To be fair, it is horrifying what Mr. Mercedes has done and plans to do, but there’s no ghosts or ghouls or alternate worlds in this book. In fact, I would categorize this as detective fiction. Retired Detective Bill Hodges is haunted by the one crime he didn’t solve in his tenure–the mysterious, gruesome Mercedes killer, who ran over people waiting in line with a Mercedes and then abandoned the vehicle and escaped, unidentified. The book follows the detective, whose life after his career leaves a lot to be desired. We see him make a transformation from severe depression and isolation to more active involvement and connections–all because he receives a letter from the Mercedes killer, taunting him. I would rate this as a solid book and a good read, but nothing spectacular. Not like last summer’s Dr. Sleep, the sequel to The Shining. That one delved deep into the issues of addiction and alcoholism, and had a seemingly more epic conclusion. But I suppose with a sequel, your reader carries the entire first book with them as well, so you can go a little deeper. The climax of this Mr. Mercedes was, upon reflection, perhaps more powerful than epic. We see some unlikely heroes arise and the denouement gave me some hope for people’s ability to change and transform, even later in life. I find that as King ages, and as I age, the stories examine the human condition and seem more hopeful than some of his earlier work. Perhaps that hope was there, but I wasn’t looking for it as a younger reader? Either way, pick up this book if you’re looking for a good detective story (albeit one with swearing and some gross descriptions of death). Oh, and you know I can’t finish this review without mentioning the fact that King paraphrases Hamlet when the killer is feeling a little blue: “he has to be doing something. He needs to feel…how did Shakespeare put it? Taking arms against a sea of troubles.” Nothing like a reference to Hamlet’s existential speech to make an English teacher like your book even more. Horn Went Beep. Engine Purred. Friendliest sounds you ever heard. So I decided to change up my genre to review this week to the picture book. This summer I was lucky enough to stay home with my not-quite-one-year-old son. Naturally, we did a TON of reading, but there was one book we kept coming back to – Little Blue Truck. This is a fun farm animal picture book written by Alice Schertle and illustrated by Jim McElmurry. It tells of Little Blue Truck and follows him as he encounters a variety of animals and helps out the grouchy old Dump Truck. What makes this story so appealing is not only the fun characters (tons of animal noise practice and opportunity for fun voices! ), but the natural rhythm that occurs throughout. Not only that, but there is a nice lesson on the importance of helping others out when they are in a bind. Love this book! And love the sequel as well – Little Blue Truck Leads the Way (Blue Truck in the city!). If you have a child, this is definitely a book worth adding to your bookshelf!